Finding that ideal sunset or sunrise is always a big deal for me. I would also go so far as to say that they are big for anyone that considers themselves a photographer of any caliber. The majestic beauty of the sun fighting its way through the haze and dust of the continent as it rises from the east or sets from the west cannot be understated. Yet, not all sunsets and sunrises are the same and seldom do they look the same day after day. Before a large rainstorm, the skies of the west are generally cleaner. This causes the light from the sun to refract less and give us cleaner blues and sharper clouds. When the storm has cleared, the winds calm down and the dust rises to cause the light to refract and splinter into the glorious oranges we love to see. Yesterday was a particularly standard pre-storm day that delivered exactly what it should have, a bland and lackluster sunset. Yesterday seemed like a great day for taking a photograph of the sunset. If only I had looked closer at the weather. While it was a great day yesterday, today is looking to possibly be a brute with a storm barreling in from the west. Already I have received notifications about possible Tornadoes from the weather apps on my phone. If I would have looked ahead, I wouldn’t have been so stoked for the sunset and would have taken the time to relax a little more and enjoy it. The photographs of the sunset are decent but since the air was from the wind, they weren’t spectacular, by any means. 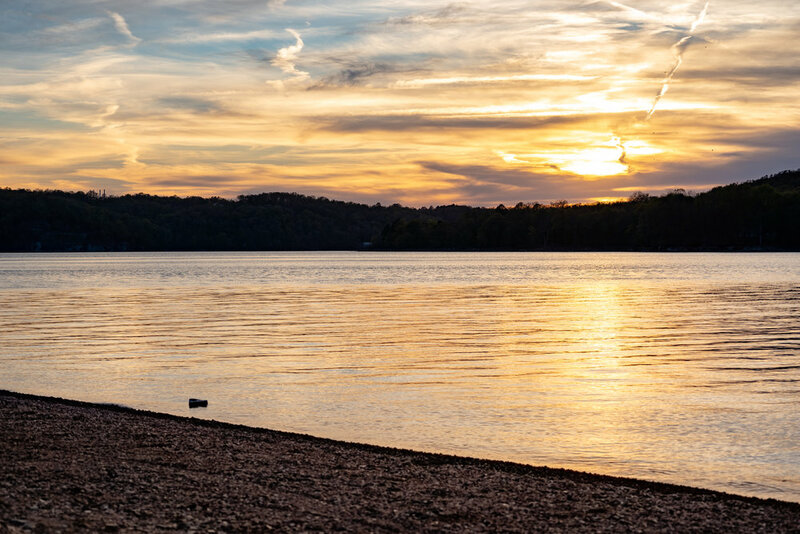 This cool and majestic sunset was at Beaver Lake near Springdale Arkansas in April. The really interesting thing about this outing is that I got a couple of photographs that aren’t of the sunset but seem to be either more interesting or more powerful than these. My favorite is the cold Oregonian looking beach scene while my wife, Kelli, seems to prefer the interesting tones and depth of the rocky shores with the hibernating bush/tree. Kelli found this to be the more interesting of the bunch. This Oregonian like shoreline is one of my most favorite photos from the excursion. What do you think about the photographs from this excursion? Which ones are your favorite?